Amino acids obtained through your diet are usually safe, but following a very high-protein diet for a long time might cause a problem. Side effects aren't common when taking amino acid supplements, but several individual amino acids carry a higher risk. If you're pregnant, take medications or you've been diagnosed with diabetes, kidney disease or liver disease, talk to your doctor to be sure supplements are safe for you. The body has the ability to separate amino acids into their component parts. This breakdown naturally occurs when one part -- the amino group -- is needed to make new amino acids. Another part of the amino acid can be converted into glucose and used for energy. The amino group contains nitrogen, which exists in the form of ammonia after it's cleaved from the original amino acid. This toxic ammonia must be removed from the body, so it binds with another amino acid, then goes to the liver. The liver turns it into urea and sends it to the kidneys for elimination in urine. The kidneys help regulate the body's acid-base balance. Some amino acids are acidic, while others are basic, but dietary protein exerts an overall acidic effect. When a high-protein diet is the source of excess amino acids, it makes the kidneys work hard to maintain balance. If you get too many amino acids, they're broken down and eliminated because the body doesn't store them for future use. Then levels of ammonia and urea increase, which forces the kidneys to filter more blood. For this reason, people with chronic kidney disease usually follow a low-protein diet to alleviate stress on the kidneys. If you have a history of uric acid kidney stones, a diet high in protein may increase the risk of developing more stones in the future, reports PubMed Health. Arginine may cause gastrointestinal distress, such as bloating, abdominal pain and diarrhea. It could also increase the risk of gout and lead to an unhealthy drop in blood pressure. Arginine supplements may significantly affect levels of potassium in people with kidney disease, reports MedlinePlus. High intake of methionine can boost blood levels of another amino acid, homocysteine. Too much homocysteine damages blood vessels and may increase the risk of blood clots, notes FamilyDoctor.org. The branched-chain amino acids -- leucine, isoleucine and valine -- are transported into your brain using the same pathway as the amino acid tryptophan. As a result, they compete for access to a limited number of transporters. When supplements cause high blood levels of branched-chain amino acids, less tryptophan gets into the brain. Because tryptophan is used to produce serotonin, you may subsequently have lower levels of mood- and sleep-regulating serotonin. Some of the risks associated with high amino acid consumption come from the high-protein diet that supplies them. Replacing carbs with protein may lead to a nutritional imbalance because complex carbs, such as beans and whole grains, are packed with fiber, vitamins and minerals. As proteins are digested, the body becomes more acidic, and it may pull calcium from your bones to offset the acidity. A high-protein diet that only lasts a few weeks isn't likely to weaken bones, but the impact over the long term might be more serious, advises the Harvard School of Public Health. 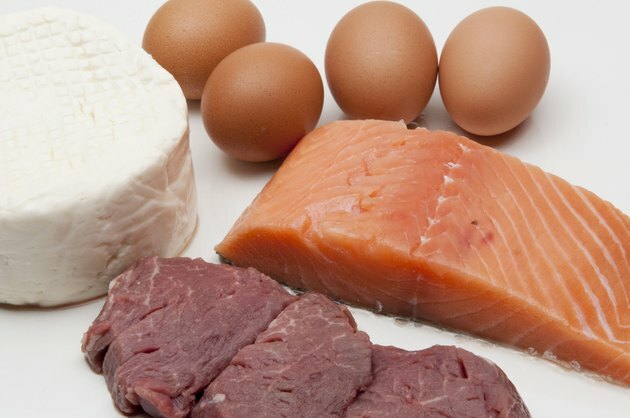 More research is needed to understand exactly how a high-protein diet affects bone health.